City Orthodontics is honored to provide top quality orthodontic treatments to the families of Toronto. You are our number one priority during any treatment whether it is ceramic braces, or Invisalign. We offer only the best services and state-of-the-art equipment to help you towards your goals for a beautiful and healthy smile. Among the new technologies available, we offer new ways to help speed up your treatment. There are different systems nowadays to accelerate orthodontic treatment. Please see below to learn more about the Accelerated Orthodontics systems that we offer at City Orthodontics. 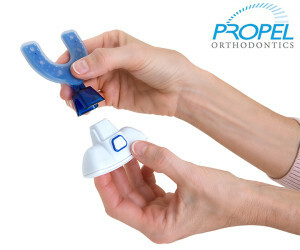 PROPEL® works through micro-osteoperforation with your own biology to stimulate the bone surrounding your teeth; helping the teeth to move faster and more predictably into their ideal position so we can reveal your new smile faster and in fewer visits to our office. It can be used to accelerate treatment overall but it can also be used selectively to make a specific tooth movement occur easier if your doctor feels it is a difficult movement to do. City Orthodontics is excited to offer accelerated options to our patients to make their orthodontic experience as comfortable as possible. Please contact us, if you have any questions or concerns about accelerated treatment or any orthodontic services for children or adults in Toronto, ON. Begin accelerating your treatment today and get closer to that beautiful smile you deserve! AcceleDent is a device designed to increase the cell activity and blood flow in the bone around your teeth, to accelerate orthodontic treatment. With patented technology this hands-free device vibrates your teeth and jawbone so that the moving teeth during treatment move into their new placement faster and easier. AcceleDent offers fast, safe, and gentle results for all of our patients and it is only used for 20 minutes a day for effective results. Our doctors will discuss Acceledent with you at your initial visit or during your treatment. Below we have provided a list of benefits of AcceleDent. Hands-free device you can use while doing anything like reading, watching your favorite TV show, or even doing schoolwork. So no excuses! 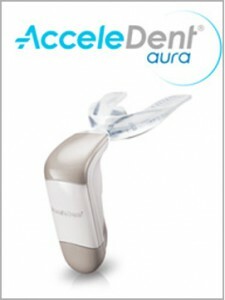 AcceleDent is both lightweight and comfortable. You will easily get used to it!